The Arrow Eco 300 is the economical finishing option for roll materials. Perfect for short run label finishing, as well as pre-press sampling. The Eco 300 allows label producers to die-cut labels with ease. The Eco 300 allows for companies who are using pre-cut materials to save money by switching to continuous materials. Easy to learn software will allow you to be up and running in minutes. 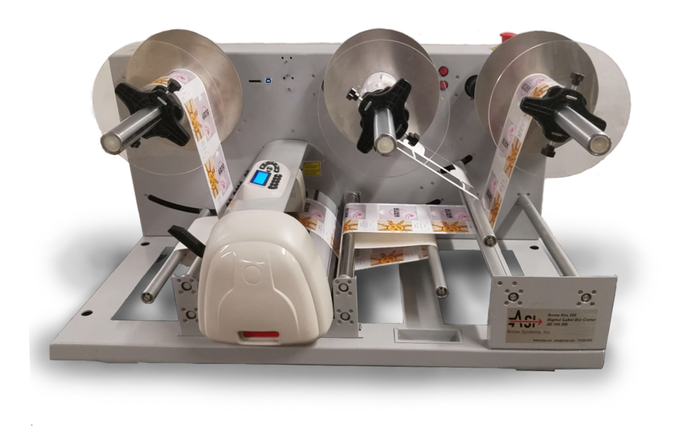 The Arrow Eco 300 is a roll-to-roll label cutter that can be used to cut out stickers and labels on virtually any substrate. Using specially designed eye marks, the Eco 300 allows for seamless die-cutting of all shapes and sizes. Its compact design allows it to fit in almost any environment. The Eco 300 is the ideal cutting solution for short run, in-house label production. Save TIME and MONEY by using continuous media to print instead of pre-cut media!